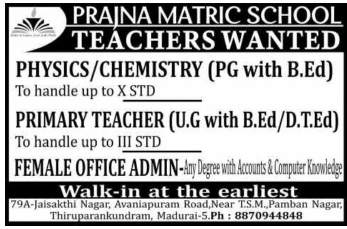 Prajna Matric School, Madurai has advertised in THE DINAMALAR newspaper for the recruitment of Teachers vacancies. Interested and eligible job aspirants are requested to appear walk in by earliest. Check out further more details below. About School: Prajna Matriculation School, Madurai is a private school affiliated to Tamil Nadu School Education Board.